For the entire month of October, the L.A. 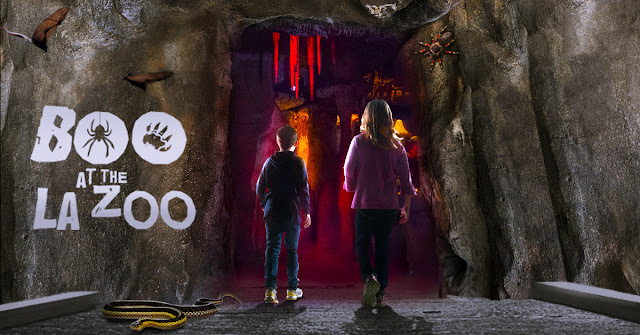 Zoo will have additional spooky-themed activities from 10a.m. - 4p.m. Likewise, Trick or Treating will be October 24, 25, and 31. Super Natural Caves – Explore dim caverns that put a spooky spotlight on the incredible powers of animals 10 a.m. to 5 p.m. Animals & You Boo – Get up close to scaly, slithery, creepy, crawly creatures. So close, in fact, you may even get to touch them! At 10: 45 and 11:45 a.m. daily, with an extra show at 12:45 p.m. on weekends. Graveyard Safari – Trek through a hay bale maze and encounter creatures of the Los Angeles Night 10 a.m. to 4 p.m.
Freaky Framed Photo Op – Take a frightfully good picture among the portraits of a haunted gallery 10 a.m. to 4 p.m. The L.A.I.R. – No decorations needed for this goose bump-inducing adventure where you’ll come face-to-face with rare snakes, poisonous frogs, and venomous lizards. Open 10 a.m. to 4:30 p.m.
Creepy Crafts – Create bat and spider web masterpieces 10 a.m. to 4 p.m. Dress Up with Campfire Cathy – Enjoy sing-alongs and free face painting at 11 a.m., 12:30 p.m., 2 p.m. and 3 p.m.
Masterpiece Pumpkins – Marvel at expert carving demonstrations 10 a.m. to 4 p.m. Fearsome Feedings & Creature Treats – Watch as our animal residents enjoy seasonal treats all their own. See schedule below. Warning: Includes carcass feedings. Parental discretion is advised. Strolling Characters – Meet and take pictures with spooky and fanciful characters 10 a.m. to 4 p.m.